ABSTRACT. The native arteriovenous fistula (AVF) is the preferred vascular access because of its longevity and its lower rates of infection and intervention. Recent studies suggest that the AVF may offer a survival advantage. Because these data were derived from observational studies, they are prone to potential bias. The use of propensity scores offers an additional method to reduce bias resulting from nonrandomized treatment assignment. Adult (age 18 yr or more) patients who commenced hemodialysis in Australia and New Zealand on April 1, 1999, until March 31, 2002, were studied by using the Australian and New Zealand Dialysis and Transplant Association (ANZDATA) Registry. Cox regression was used to determine the effect of access type on total mortality. Propensity scores were calculated and used both as a controlling variable in the multivariable model and to construct matched cohorts. The catheter analysis was stratified by dialysis duration at entry to ANZDATA to satisfy the proportional-hazard assumption. There were 612 deaths in 3749 patients (median follow-up, 1.07 yr). After adjustment for confounding factors and propensity scores, catheter use was predictive of mortality. Patients with arteriovenous grafts (AVG) also had a significantly increased risk of death. Effect estimates were also consistent in the smaller propensity score–matched cohorts. Both AVG and catheter use in incident hemodialysis patients are associated with significant excess of total mortality. Reducing catheter use and increasing the proportion of patients commencing hemodialysis with a mature AVF remain important clinical objectives. The native arteriovenous fistula (AVF) for hemodialysis has been described as the Achilles heel but also the Cinderella of hemodialysis (1). The AVF is the vascular access of choice for hemodialysis because of its longevity and lower complication rates compared with arteriovenous grafts (AVG) and catheters (2–4⇓⇓). However, with the changing demographics of the end-stage renal disease (ESRD) population worldwide, the construction of an adequate AVF in all patients has proven difficult. Recent registry data from the United States has shown that although the rate of AVG use has been declining, there has been a corresponding large increase in the use of both temporary and permanent central venous catheters compared with a smaller increase in AVF (5). Two recent studies have suggested that this increasing reliance on catheters may come at a high cost: higher total and infectious mortality in those patients (especially those with diabetes mellitus) with a catheter or AVG compared with an AVF (6,7⇓). However, caution is required in the interpretation of these studies because of the inherent study designs, which were retrospective and observational in nature. Ideally, to answer the question about whether vascular access type is independently associated with an increase in mortality in hemodialysis patients, a randomized study needs to be performed. Many would think this unethical, given the apparent superiority of the AVF. The propensity score is a statistical technique that can reduce bias resulting from the nonrandom nature of the treatment assignment seen in observational studies (8–11⇓⇓⇓). In the case of vascular access, the propensity score will describe the probability for any given patient, on the basis of his or her characteristics, of receiving a catheter compared with an AVF or an AVG compared with an AVF. The estimated propensity scores can then be used either as a stratification variable or as a controlling variable in a multivariable model; or it can be used to derive a propensity score–matched cohort where all of the variables used to derive the propensity score are balanced (8,9,11⇓⇓). For example, patients who received a catheter are matched with those the same propensity to receive a catheter but who actually received an AVF. The propensity score method has recently been applied to questions in nephrology regarding mortality and late referral to a nephrologist (12) and mortality in elderly patients receiving hemodialysis versus peritoneal dialysis (13). We therefore conducted an analysis investigating the relationship between access type and mortality in all new ESRD patients commencing hemodialysis between 1999 and 2002 in Australia and New Zealand. To reduce potential bias from the nonrandomized assignment of vascular access, we constructed propensity scores for the allocation of AVG versus AVF and catheter versus AVF and used these in the survival analysis. The Australian and New Zealand Dialysis and Transplant Association (ANZDATA) registry collects information on all patients with ESRD in Australia and New Zealand. Data are collected at 6-mo intervals, in March and September of each year. Data collection in relation to vascular access for hemodialysis patients began only recently, commencing from the March 1999 survey. An inception cohort was created by identifying all new adult patients (age 18 yr or more at entry to the ESRD program) who commenced their dialysis treatment with hemodialysis in Australia and New Zealand between the April 1, 1999, and March 31, 2002. Vascular access is reported as one of four options: AVF, synthetic AVG, permanent central venous catheter, or temporary central venous catheter. The vascular access used at the first hemodialysis treatment is not collected, only the access functioning and in use at the date of the survey. For example, if a patient was dialyzing via a catheter but also had an AVF in situ that was not mature, the patient’s vascular access would be coded as a catheter. As discussed previously (14), the temporary (n = 533) and permanent central venous catheter (n = 587) categories were combined because of possible misclassification arising from interpretation of the definitions. Comorbid conditions for each patient, as determined by the treating physician, were collected at the start of renal replacement therapy. The presence or absence of coronary artery disease, peripheral vascular disease, cerebrovascular disease, and chronic lung disease was recorded in three categories: no, yes, or suspected. For the purposes of this analysis, the “yes” and “suspected” groups have been combined. Data on hypertension requiring treatment, the presence or absence of diabetes (type I or II), and cigarette smoking (never, current, or former smoker) were also collected. If the patient began dialysis treatment less than 3 mo after being first referred to a nephrologist, this was defined as a late referral. Body mass index was calculated from the height and weight data and was initially modeled separately both as a continuous and then categorical variable split in four categories: less than 20 kg/m2, 20 to 24.9 kg/m2, 25 to 29.9 kg/m2, and 30 kg/m2 or more, with the dry weight at the time of the survey used in the calculation. Hemoglobin was not studied in the analysis because data on this have only been collected in the registry since October 1, 2000. The primary outcome for the study was all-cause mortality. The primary cause of death was coded by ANZDATA from information from the treating unit. Cause of death was divided into six categories: cardiac, vascular, infective, malignancy, other, and unknown. Death from infectious causes was examined as a secondary outcome. Follow-up was determined to September 30, 2002. Patient data were censored if the patient received a renal transplant during the study, at the date of last known follow-up, or at study end (September 30, 2002). All values are presented as median (interquartile range) or total number (percentage). Baseline characteristics between the vascular access types were compared by the Mann-Whitney U test for continuous variables and the χ2 test for categorical variables. Survival was assessed by calculating Kaplan-Meier survival curves, and the groups were compared by the log-rank test. The Cox proportional-hazard model was then used to determine any association between vascular access type and patient survival. A search for potential confounding factors was based on assessing the effect of each variable on the access type mortality relationship and not whether the factor itself predicted patient survival. If a covariate produced a 10% or more change in either coefficient for AVG or catheter use on patient survival (compared with AVF), then it was considered to be a confounding factor in the access-type patient survival relationship (15). All such confounding factors were then entered in the multivariable model. Variables were removed from the multivariable model in a stepwise fashion, beginning with the risk factor with the highest P value. The likelihood ratio test was used to confirm that the deleted factor did not contribute significantly to the multivariable model. Once this final model was determined, all other factors initially not found to be confounders were then reintroduced into the model to check for any possible residual confounding. Potential interactions between age and diabetes mellitus on vascular access type were also assessed, because this had been shown to be of significance previously (6). The assumption of proportional hazard for the final models was checked with the use of scaled Schoenfeld residuals (16). By means of logistic regression, separate propensity scores were calculated to estimate the probability (propensity) for the placement of an AVG versus AVF and a catheter versus AVF, respectively. Covariate selection for the propensity score development was based on our previous findings examining various demographic and patient characteristics associated with AVG and catheter use (14,17⇓) and knowledge of the literature. Specific components used to estimate the propensity score are shown in Table 1. We calculated the area under the receiver operating characteristic (ROC) curve to quantify overall model predictability (18). The propensity scores were then used in two ways (11). First, the propensity score (as a continuous variable) was entered into the final multivariable Cox models. Second, two smaller cohorts were obtained where a treated subject (AVG or catheter) was matched to a control subject (AVF) on the basis of the propensity score. Matching was performed by Mahalanobis metric matching within calipers defined by the propensity score (11) by using the publicly available matching algorithm “psmatch2” (19). The overall quality of the matching was assessed by calculating the percentage bias reduction among the variables used to calculate the propensity score and assessing for any imbalances in the baseline characteristics between the two groups. The sample size decreases as the adequacy of matching increases, and therefore, the final propensity matched cohorts were determined by balancing adequacy of the matching without decreasing the sample size excessively. We considered a finding to be statistically significant if the two-sided P value was less than 0.05. All analyses were conducted by Intercooled Stata 8.0 (StataCorp, College Station, TX). A total of 3982 patients commenced hemodialysis in Australia and New Zealand during the 3-yr study period. Thirty-four patients were excluded because they were younger than 18 at the commencement of their first hemodialysis treatment. Additionally, a further 195 patients did not have a vascular access type recorded at their first survey entry, thus leaving a total of 3752 patients available for analysis. The majority of patients (85%) were treated in Australia. Table 2 summarizes the baseline characteristics of the whole cohort. The AVF was the most common form of vascular access in use (60%), with catheters the second most frequent (30%). There were a number of statistically significant differences between the three access types with respect to the demographics and comorbidity. The total follow-up duration and number of deaths, grouped according to access type, are displayed in Table 3. One patient in the AVF group and two in the catheter group were recorded as having died on the same date as commencement of dialysis treatment and were excluded from further analysis. There were 254 deaths from 2939.9 person-years of follow-up in patients dialyzing with an AVF, yielding a mortality rate of 86 per 1000 person-years. Patients who had catheters had the highest death rate (261 per 1000 person-years); the AVG rate was in between, at 146 per 1000 person-years. Death from a cardiac cause was the most common cause of death (222 patients, 36%), with 10% of deaths (57 patients) occurring as a result of an infection. There were no patients lost to follow-up during the study period. Patients who dialyzed with a catheter in the first 6 mo of their dialysis treatment were significantly more likely to die compared with those with an AVF (P < 0.001, log-rank test). Kaplan-Meier survival curves are shown in Figure 1a. A Cox regression model was then built to describe the relationship between catheter use and all-cause mortality compared with AVF. Of the factors listed in Table 2, only age at first treatment, late referral, coronary artery disease, peripheral vascular disease, and cerebrovascular disease were found to be confounders of the relationship between access type and mortality. All of these factors, in addition to gender, were included in the multivariable model. The final models were stratified for the presence of coronary artery disease because of an interaction between coronary artery disease and the hazard over time. There was no evidence for an effect modification on the access type mortality relationship according to age or diabetes mellitus. Figure 1. Kaplan-Meier survival curves for all-cause mortality for the whole cohort (A) (n = 3381) and the propensity score–matched cohort (B) (n = 1479) for patients with arteriovenous fistula (AVF) versus catheters. In the final Cox model, assessment of the Schoenfeld residuals indicated a significant interaction between catheters and the hazard over time, in violation of the proportional-hazard assumption. To satisfy the assumption, the analysis of the catheter data has been stratified into three groups according to the duration of dialysis at the time of the data capture (Table 4). After controlling for confounding factors, catheter use was significantly associated with an approximately two- to threefold increase in the risk of death in all three stratified groups. We then added to the model the calculated propensity score of catheter use compared with AVF on the basis of the characteristics in Table 1. Our propensity score model performed moderately in distinguishing between patients with a catheter to those with an AVF (area under ROC curve, 0.76). The addition of the propensity score to the multivariable model produced similar results in all three groups (Table 4, line 3). We then repeated the analysis by using the selected propensity score–matched cohort (n = 1479). Crude all-cause mortality rates in this cohort were 115 per 1000 person-years (95% confidence interval [CI], 94 to 142; 90 deaths) in patients with an AVF and 242 per 1000 person-years (95% CI, 211 to 277; 209 deaths) in patients with a catheter. There were no significant differences between the groups (catheter n = 855, AVF n = 626) with respect to all of the variables listed in Table 2, in addition to geographical location and ANZDATA survey date (all P values >0.20). Again, catheter use was a significant predictor of all-cause mortality in each of the stratified groups, although the effect in the 60- to 119-d groups was attenuated compared with the larger cohort (the confidence intervals, however, still overlapped; Table 4, line 4). 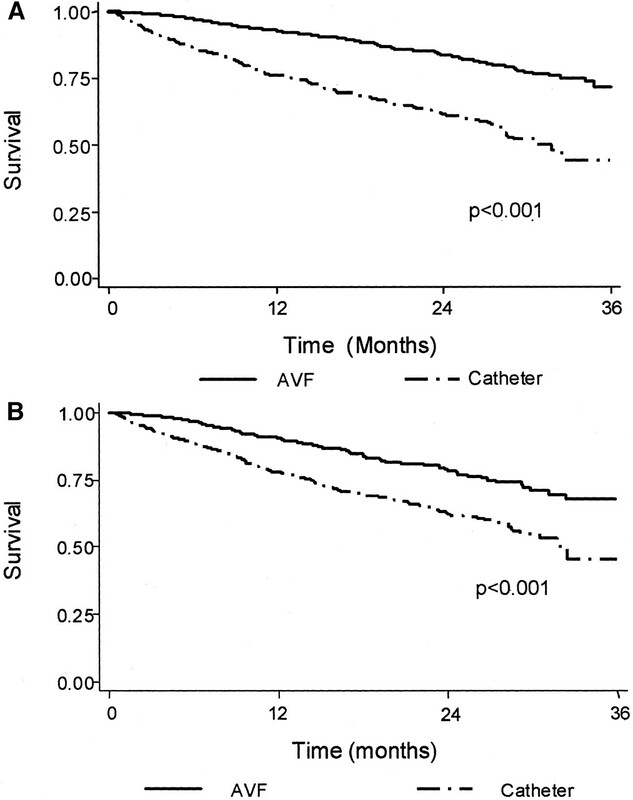 A Kaplan-Meier plot demonstrating survival in the propensity matched cohort grouped into catheter and AVF use is shown in Figure 1b. There is a statistically significant difference between the two curves (P < 0.001, log-rank test). Figure 2a displays the Kaplan-Meier plot for survival of patients with AVG and AVF with a significant difference between the two groups (P < 0.001, log-rank test). After adjustment for confounding factors, patients with AVG had a 50% increase in the risk of death compared those with AVF (Table 5). We then introduced the propensity score into the multivariable model. Again, our propensity score model demonstrated moderate discrimination between patients with AVG as opposed to AVF (area under the ROC curve, 0.79). The risk of death remained essentially unchanged with the additional adjustment of propensity score (Table 5, line 3). Figure 2. 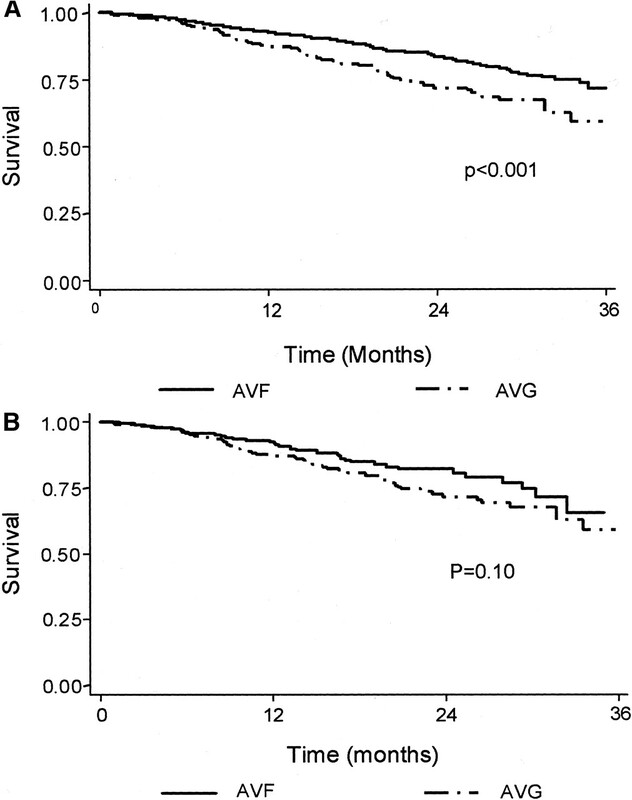 Kaplan-Meier survival curves for all-cause mortality for the whole cohort (A) (n = 2632) and the propensity score–matched cohort (B) (n = 637) for patients with arteriovenous fistula (AVF) versus arteriovenous grafts (AVG). Finally, we assessed the risk in a smaller cohort of patients (n = 637). Again, the propensity score matched on the baseline characteristics, survey period, and geographical location (AVF n = 281, AVG n = 356). Crude all-cause mortality rates were 106 per 1000 person-years (95% CI, 77 to 145; 38 deaths) in patients with an AVF and 148 per 1000 person-years (95% CI, 116 to 188; 66 deaths) in patients with an AVG. The risk of death remained elevated, although a little attenuated (1.39 versus 1.50, Table 5, line 4) and lost statistical significance, almost certainly as a result of the smaller sample size. The Kaplan-Meier plot demonstrating survival grouped according to AVG and AVF use in this smaller cohort is shown in Figure 2b. There was no significant difference between the two curves (P = 0.10, log-rank test). We then examined the relationship between access type and infectious mortality. Crude mortality rates for infectious etiology are given in Table 3. Results of the multivariable analysis are shown in Table 6. There was a significant increase in the risk of death from infection in patients with catheters, both with and without adjustment for propensity score. The risk estimate was somewhat attenuated in the smaller propensity score–matched cohort and was no longer statistically significant. For patients with AVG, the effect estimates were very similar between the two multivariable models and also the smaller matched cohort, with an approximately 60% to 70% increase in the risk of infectious death. However, given the small numbers, all confidence intervals remained nonsignificant. We have demonstrated, in this large cohort of new hemodialysis patients, a significantly increased risk of death in patients who receive hemodialysis treatment via either a catheter or an AVG in their first 6 mo of treatment compared with an AVF. This elevated risk remained after controlling for confounding factors and the calculated propensity score. In addition, there also appears to be a higher risk of infectious mortality associated with catheter and AVG use in this cohort, although it was statistically significant in the catheter group only. We believe that there are a number of important strengths to the study presented here. First, the study population consists only of new patients beginning hemodialysis, and thus each patient’s risk begins at the same time: at the start of their dialysis treatment. The identification of this so-called inception cohort is particularly important in any prognostic study (20–22⇓⇓). Second, the use of the propensity score to control for known selection bias strengthens the validity of the overall results (8–11⇓⇓⇓). The propensity score method can be conceptualized as going beyond that of traditional multivariable modeling (11). Finally, because ANZDATA is comprehensive in its data capture, this study is representative of all patients on hemodialysis in Australia and New Zealand and therefore does not suffer potential bias from unlisted patients. This study therefore confirms and extends recent findings (6,7,23⇓⇓) that vascular access type not only contributes to patient morbidity, but also may contribute independently to patient mortality. The results for patients who used a catheter in the first 6 mo of treatment catheters are striking. A two- to threefold increase in the risk of death is seen in patients receiving hemodialysis via a catheter compared with the AVF. The risk appears to be higher for those patients who first entered the ANZDATA registry when they had been on dialysis for 120 to 180 d. It is likely that these patients had been using a catheter for their whole treatment duration up to this time, and so this could conceivably represent a greater risk, perhaps related to the length of time the catheter had been in use. Caution, however, is required, given that there is considerable overlap between the confidence intervals for the three groups. The addition of the propensity score to the multivariable model did not change the point estimates significantly. The results for the smaller propensity score–matched cohort were similar except in the 60- to 119-d group, where the risk was somewhat lower, although still significant (1.66 versus 2.31). However, there is still overlap between the confidence intervals between the two estimates, and therefore it is likely that the true risk falls between the two. These two different methods of using the propensity can also be seen as complementary. A disadvantage of matching on the propensity score is the reduction in the size of the data set when there is a large number of unmatched subjects. However, this reduction in power is made up by the efficiency in matching. Certain conclusions can be made from the two models. We can see that there is a clear increase in the risk of death in all of the models, on the order of 1.5 to 3. The biological plausibility for this increased risk of death is not completely clear. Some of this risk could be mediated via infection, but this is unlikely to account for all of the increased risk. Late referral has been accounted for, but other unmeasured factors that may be associated with catheter use, such as differences in pre-ESRD health care utilization (24), could play a part in the association. Increased catheter use may reflect cardiovascular disease, which could also explain the elevated risk. The finding of a 1.5- to 3-fold increase in all-cause and infectious mortality with catheter use is of major concern. This is especially so given that the most common use for catheters in Australia and New Zealand is to enable fistula maturation (14,25⇓). We have previously estimated that in Australia and New Zealand the proportion of patients commencing hemodialysis with a native fistula is approximately 50% (14,25⇓). Therefore, many patients are exposed to an excess risk of mortality as the result of the temporary use of a catheter, which could possibly be avoided in a substantial number of patients by earlier AVF construction. Because data on vascular access in Australia and New Zealand have been collected only relatively recently, we cannot be sure whether catheter use is increasing (although the results of the logistic model show a possible increasing risk with successive survey periods). Recent United States Renal Data System (USRDS) results demonstrate an increasing rate of catheter use (both temporary and permanent) with a reduction in AVG use (5). AVF rates have been increasing at a much slower rate over the same corresponding time. These recent trends in both countries are therefore of major concern, given the results of this and other studies (6,7,23⇓⇓). Given the differences of access type between Australia and New Zealand and other countries (for example, the United States (5,26⇓)) the absolute effects of these results to countries with a lower AVF prevalence are likely to be greater. Patients with AVG also were at increased risk of all-cause and infectious mortality compared with AVF. This risk, however, was lower than that compared to patients with catheters. The estimates obtained remained consistent over both the multivariable and propensity score–adjusted models but were attenuated in the propensity score–matched cohort and no longer statistically significant. Thus, caution is required as to whether there is a true increased risk of death associated with AVG use. The effect estimates for infectious mortality were also increased compared with AVF and also remained consistent over the different models, although they did not reach statistical significance. Three studies (one in abstract form only) have previously been published specifically addressing the vascular access patient mortality relationship. The first study, which used data from the USRDS Dialysis Morbidity and Mortality Study wave 1 study (which was collected in December 1993), studied both prevalent patients (n = 5507) and also an incident subgroup (n = 1090). For both cohorts, results were presented stratified by the presence of diabetes because there was a significant interaction between vascular access type and diabetes. Diabetic incident patients were found to have a nonsignificant increased mortality risk associated with both catheters (1.91, 0.98 to 3.72, P < 0.06) and AVG (1.64, 0.84 to 3.22, P = 0.15). Nondiabetic incident patients did not seem to have an elevated risk of death in this subgroup (catheters 1.16, 0.72 to 1.87, P < 0.55, AVG 1.12, 0.69 to 1.82, P < 0.85). In the prevalent cohort, the risk in the diabetic group was similar to the incident group; however, the nondiabetic prevalent patients who used catheters seemed to have a greater risk: 1.70 versus 1.16 (the AVG risk was similar: 1.08 versus 1.12). The second study found very similar results to the USRDS cohort. Pastan et al. (7) studied prevalent patients only and reported results by using logistic regression instead of Cox regression (the authors did state that an analysis that used Cox regression produced similar results). In this study, all-cause mortality was increased by 10% in all patients with an AVG and 40% in those with a catheter (both NS). For patients with diabetes alone, the risk was higher (20% for AVG and 70% for catheters, significant for the catheter group only). Finally, data from the ESRD Core Indicators/Clinical Performance Measures Project demonstrated a significant 20% and 38% increase in the risk of 12-mo mortality for AVG and catheters, respectively. The risk was apparently similar for both incident and prevalent patients. Our study, although consistent in demonstrating an increased risk of death associated with catheter and AVG use, produced hazard ratios that are consistently higher, especially for patients with catheters. The differences in the results between the different studies may be due to differences in sample size, inclusion criteria, and possibly differences in clinical practice between the two countries. An important difference is the exclusion of early deaths in the US-based studies where only patients who survived >90 d on dialysis are included. One study has demonstrated that depending on race and gender, age-adjusted mortality rates could be underestimated by 3% to 12% when patients who die within the first 90 d are excluded (27). Therefore, the risk in the US dialysis population may well have been higher if these patients were included. We have repeated our analysis excluding the early deaths (those patients dying in the first 90 d from their first dialysis treatment), and we obtained similar results to that presented (data not shown). Another important difference is that we were able to control for the presence of late referral to a nephrologist, which not only is an important predictor of whether a patient receives a catheter (14,17⇓), but is itself a predictor of early mortality in incident patients (12,28⇓). Finally, we did not include dose of dialysis in our multivariable models. As noted previously by others, this can be considered as an intermediate event in the access type mortality relationship (6). Patients with catheters dialyze at lower blood flow rates compared with AVG and AVF, and this is certainly the case in this cohort (data not shown). In addition, residual renal function will also be important in this incident cohort, and so any calculated Kt/V will not be a true reflection of each patient’s overall clearances. Albumin is not collect by the ANZDATA registry. However, as discussed by others (6), albumin is also correlated with vascular access type (29) and therefore can also be considered as an intermediate event in the vascular access mortality relationship. The are a number of limitations of this study. First, the allocation of vascular access type was determined at the ANZDATA survey entry and not at the first dialysis treatment, as would be ideal. Thus, there will be a number of patients who were using an AVF at ANZDATA survey entry who had used a catheter to enable AVF maturation but whose catheters had been removed before the survey date. However, this misclassification will tend to bias toward the null and underestimate the true effect of catheters. Second, the use of a propensity score can only reduce bias for those observed covariates and not unobserved or unknown covariates as in a randomized clinical trial (9). Our propensity score models were moderately predictive for both the AVG and catheters, and so there remains some other unknown (and unobserved) covariates that have contributed to the model. Therefore, the possibility of residual confounding by an unknown or unobserved covariate cannot be excluded. Because the propensity score method applies to a binary outcome, we had to split the cohort to derive each model. Despite this, it has been recently argued that this does not impede the validity of the approach, and it is in fact a significant advantage over the traditional model-based approach (9). We are not aware of any examples in the literature of propensity score methodology that used multinominal logistic regression as would apply in this example, although there has been recent discussion of the method applied to ordered variables (10). We were also not able to include important laboratory data (such as serum albumin and phosphate), which are important independent mediators of mortality, because they are not collected by the ANZDATA registry. Finally, the comorbidity data captured is only based on the opinion of the treating physician and not strictly defined criteria, as would be ideal. There is also no information on the severity of disease, and the comorbidity data were collected at the time of commencing dialysis (this has currently changed; comorbidity is now updated at each survey). In conclusion, we have shown that among new patients commencing hemodialysis in Australia and New Zealand, there is a significant increase in the risk of death in those patients receiving treatment via a catheter or AVG compared with AVF in the first 6 mo of their treatment. This is particularly important given that many patients do not have a functioning AVF in place at the commencement of hemodialysis treatment. These data therefore provide strong evidence for the need to provide timely pre-ESRD care to enable AVF construction and maturation well before the need for dialysis treatment. K.R.P. is a recipient of a National Health and Medical Research Council (NH&MRC) Medical Postgraduate Scholarship. We are grateful to Dr. E. Villanueva for his statistical advice and to the Australian and New Zealand renal units, patients, and staff for their cooperation and contributions to ANZDATA.